I folded paper square boxes of various colours - blue, red, green, yellow and orange. My teaching objects were the Lego, duplo. I asked Jare to sort them into their respective colours. He was quick and scored perfect. Then I asked him what the different colours were, it wasn't too bad that he got blue and orange right. Still working on the rest of the colours. During Jazz days, we used chocolates for the motivational element, but this time, I shall be kind to their teeth. I did colours with Jazz, introducing her the Chinese characters - 红, 蓝, 绿, 黄, 橙. And I got her to place the respective lego and boxes on the correct word. Not too bad, but more revision needs to be done. Colourful way to learn colours! Thanks to my mummy friends who tagged me this published article on The New Paper - 27 January, Sunday, as well as my friends who whatsapp me, that I got to read it. Benita, the reporter I spoke to, was looking for views of the recent baby boosting incentives with our family like profile - 2 children and planning or not planning for more. I volunteered my comments, but a surprise that I've to accompany a family photo with it. So, sure! 1. An increase of $2000 cash gift for each child. 1st and 2nd child now gets $6000 and the 3rd and 4th child get $8000. 2. 1 week of paternity leave and another 1 week from the 16 weeks of mummy's maternity. 1. What do you think of the recent baby bonus roll out? Enough? Can do more? Money is attractive, no matter what. The baby bonus roll out is encouraging. But we’re talking about a long term child rearing ‘project’, money depletes and being in a very competitive country, academics and skills sets are constantly required to equip our child with. These are hefty investments. 2. For you, which factors affect the decision to have more children? is it a very personal decision? how much of what the government does affects that decision? I’ve always think it’s a very personal decision, no matter how friends, family or government entice; a couple’s decision is quite conclusive. In this competitive society, we need to spend time and give attention to every child, to help them survive well. If I had too many kids, attention is divided and I become less confident in cultivating ‘quality’ kids. I want to have 'quality' children which extends beyond academic grades to social skills and moral character. Government measures are definitely added bonus to those who intend and wouldn’t mind having more than 1 or 2. But what needs to be done to those who doesn’t even want children? I think society plays the most vital role here. What can be done to help the ambitious women and yet not give up the wait to having kids in the cooperate world. What can society do to have more tolerance to kids? Making the place a more child friendly environment to live in. 3.Do measures and culture at the workplace come into play when thinking about family planning? How tolerant are people working with pregnant ladies and mothers who put family first? Companies appear to be handling these well, but it’s the people that make up the culture and environment, the colleagues and bosses. When I was pregnant with my elder, I was jobless. I quitted my job without knowing I was pregnant; I knew I was in deep trouble. Who would want a preggy on job and then go off for maternity? What’s worse, Pay for her maternity! And when I finally found a job, broke the news that I'm pregnant, before my bump was showing, I had my permanent offer swapped to a contract job, ending just before I was due to deliver. Government's good maternity intentions ruined me during those moments. I was extremely upset and I’m really cautious about getting pregnant and having a job now. 4. For your family, what is on the wish list? In terms of what the government can do, what would make or break whether or not to have one more or two more kids? I really wouldn’t mind having even up to 4 kids! But I’m aware we’re very average income earners. I confess that I've my occasional needs and wants. Money is one main issue, followed by having the quality time with each child. I really hope to be in a society where I can work and have great moments with my kids. The ideal for me would be a part time job that allows me to bring some income home and yet have time with the kids. Cost of living gets so high as we age along, inflation is too fast to pace up with. Competitiveness is driving worrying parents everywhere; can the kids do well without the ‘push’ factor from parents? It’s now not about being the top of the cream, but to survive the society. And of course, it was snippet of quotes that Benita used for her write up, not the chunk of my comments. Great opportunity we had and I urge mummies out there to have more kids! Not mainly for the sweeteners government did or did not roll out, but for the companionship among siblings and that these little ones really spice up family life, bitter and sweet, but never a regret. Jazz was an unplanned pregnancy, but I'm glad it happened because I wouldn't know how long I will procrastinate to have kids. At least, if I plan to have more, I have more years to decide before entering the unsuitable for pregnancy phase. Children are great blessings to a family! It was our first movie night out as a family, surely something we wouldn't have done in SG till the kids are older. 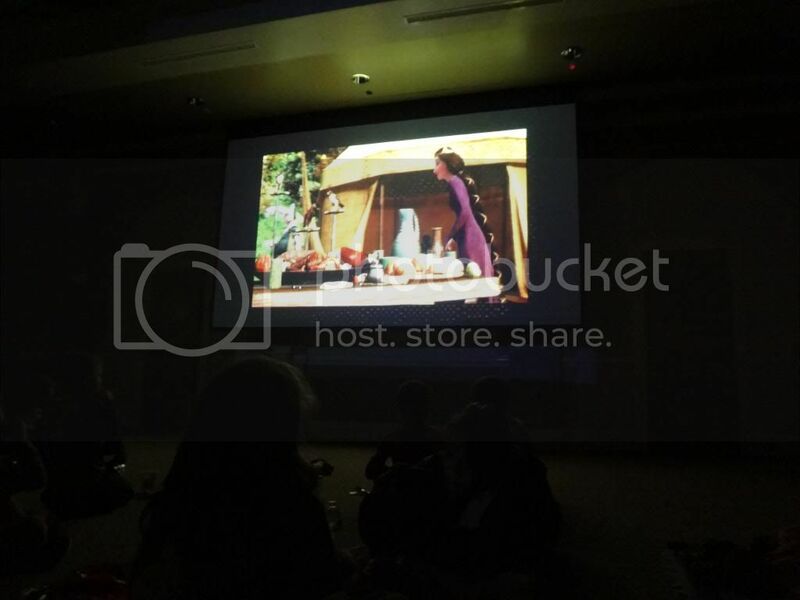 This movie night was organized by our housing community in a huge ballroom. Together with our fellow villagers, we enjoyed the evening with unlimited access to salted popcorn, drinks, snacks and gummy. It was as if we had a little picnic along with an entertaining movie, and not having to worry about restraining the kids or get stares when your child cries. It was a great night with great family bonding. We watched the cartoon "Brave," I love it! Movie with Jazz was accompanied with tons of "Why?" My goodness! The endless whys as they grow along. Jare was restless after 40 minutes, but snacks kept him entertained. More movie nights please! It was the long weekend again, we drove down to LA and San Diego for yet another round of theme parks. We went Disneyland, Legoland and Universal Studios. 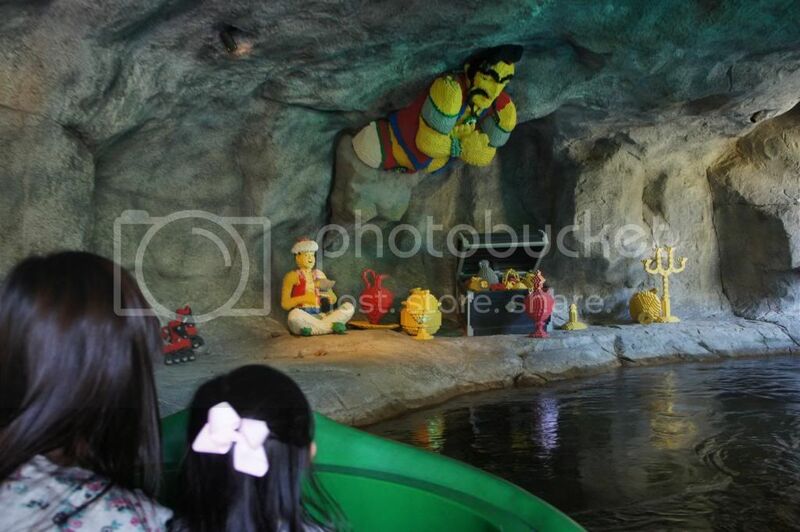 It was our first visit to Legoland. Thanks to mummy J for the tickets when she visited us 2 months ago. We haven't been to the one in Malaysia, as it wasn't ready when we left. Unsure of any comparison, maybe one distinct difference would be old and new. The Lego displayed in San Diego doesn't seem to withstand the hot scorching sun, they were mostly faded. Other than that, it still stood out impressively. Lesser human traffic and shorter lines than the always jam packed Disney parks. This made our exploration a breeze. The park has quite a few rides with very little shows. In fact we caught a 3D show, which I felt was boring. If you are short of time in the park, forget about the 3D show. Most rides were Jare forbidden. He was 2 inches fall short for most rides. Jazz could ride on most, but we thought it was 'torturing' for Jare to wait, watch us queue and do rides, while he can't. I did 2 rides with Jazz, and we did most other rides as a family. After visiting Legoland, playing lego isn't as simple as I usually thought. They are blocks of much hidden creativity with various ways to build up. Especially in Miniland USA, they did up the different states of USA with Lego. It was an eye opener! Jazz took this for us! End of the day, we walked away with 3 sets of Lego, with one belonging to the mama. Legoland convinced me to join in the building fun. I'm just afraid that I'll get hooked on fun. Lego is an expensive hobby, but much cheaper to get them in the states. It was a great day out. The theme park could have been more fun if Jare could get on more rides, or perhaps, we should have visited it later when Jare makes it taller for the mark. 2 weeks ago, we visited Muir Woods, and as the name suggests, it's a park of trees. We took stroll between giant trees with extremely fresh air and great sights. It's extremely unusual to identify myself with nature but after this trip, I thought the nature isn't that boring after all. The trees in this park are probably the tallest living things in the world. If you are a tree lover, then this is your place. After trees, we visited Muir beach. The kids love the beach, and I think I love it as much too. We caught the sunset and scrammed before it got too chilly. Nature is good for the little and big souls. It's moment of improvisation again. 1. The kids clothes are spilling out of what their closet handle can hold, I'm reluctant to buy shelves since our stay is short. 2. The kids need a better storage for their crayons and Jazz's hair accessories. From the tonnes of boxes we receive from purchasing stuff online, we made clothes shelves out of them. And from the milk carton Jazz clears at a speedy rate, we cut them up for storing the little things. A little work with great savings. Awesome deal! All we needed were some cut up milk carton, tempera paint and brushes! Additional laborers would help. I made extras to hold my accessories too! To smooth the surfaces, you may brush on those shiny waterproof coat, but we settled with simplicity. It's great sense of satisfaction to complete project storage. Great bonding and great savings! Made the first birthday cake of my life, for my beloved man. I attempted twice because the first was a failure, I left to cool overnight in an overheated place. The cake turned out hard rock the next day. Second attempt was successful with pulled in resources from my kind neighbours, when mine were wiped out for the first try. Thank you neigbours and surprise party gang. With a bunch of passionate bakers, the housewives in this village, it certainly is a motivation to self bake a birthday cake. Never mind about the appearance, I'm no professional, as long as there's something to present on the table when we sing the birthday song. Haha. But I thought the cake tasted not too bad and my great fan of it was actually Jazz. The fussy eater loves it, she had it for breakfast and supper! I baked a red velvet cake, recipe adopted from Martha Stewart. My only tweak was halving the sugar and coloring. A tad more healthy, mentally. And I actually baked a birthday cake! It isn't as challenging as I thought. It could be if I had wanted an elaborated cake. And next month, it will be Jare's birthday. Putting skills to test again. And Jazz made this card for her Daddy, all by herself. I merely provided the materials and spelling. Proud of her writing achievement. Homeschooling mum is proud when it comes to seeing efforts being paid off. 27 Dec: We drove 7 hours from Philadelphia to Buffalo, to visit the Niagara Falls. Along our drive, it got really snowy and everywhere was covered with snow. It looked so beautiful settling on the trees and houses. Wonderful sight! 28 Dec: We visited the Niagara falls, after which we drove over the rainbow bridge to Canada for a better view. View was more breathtaking at Canada, Ontario. It was freezing cold, our feet and hands were so numbed with cold. I sneaked heat packs into my boots and the kids' gloves. The kids loved the snow, but after minutes, they realised the icy snow was too much for their hands to bear. So no snowman making. And of course, we tried the origins of the place, buffalo wings! We packed some wings from Anchor Bar to our hotel as supper. Not too bad, tastes much the same as any good buffalo wings from anywhere else. 29 Dec: This was a dreadful day, a supposedly 6 hours drive became a 10 hours drive to Woodbury. The road journey was icy, and for some reasons, the man followed a route guided by his GPS through some small and narrow roads. Barely 2 hours into our drive, the wheels of our car lost friction with the icy road, the man lost control of the steering, we skidded a 180 onto the opposite traffic lane and onto the roadside, before our car threw itself into a heap of snow. Love and hate with the snow. On one hand, snow made the condition bad to drive, and on the other, our lives and car were cushioned by a heap of snow. Within that few seconds of intense shock, I was quick to look out for any cars from the opposite traffic and was ready to take cover for Jare as he was seated nearer the danger zone. But phew, no cars were oncoming and I just held on tight till this 'roller coaster' came to a halt. Man! I was in the most shocking moment of my life. In midst of these vast movements, the kids were still soundly asleep. I merely saw their heads swing left right left and it was like a dream ride to them. Their car seat belts must have restrained them from plunging forward. Always belt up! While stuck in the snow, we attempted to reverse our car, but to no avail. We knew 911 was our only help. My worry was how long we were gonna get stuck in the freezing cold with minimum food, and with two kids. Just as the man was conversing with a 911 officer, a fatherly bearded man pulled over, "Let me get you out." What a God sent angel! What would our suffering be if no one came to our rescue? Cold and hungry kids. The kind man dug out his chains, hooked them onto our car and his truck to tow us out. Within minutes, we were freed! We are truly grateful to the man who stopped by to rescue. Heartfelt thanks to him. I pray that his kind deed will be abundantly rewarded some day. It really makes a difference to offer help to those in need. After this experience, we re-routed our journey to go by the thruway (highway) for a safer drive journey, where snow plowers were frequently on road clearing the snow. I'm really thankful that we've been so well protected, even the car was unhurt. Worst could have happened. It's thankfulness beyond words. Life is precious! 30 Dec: And our agenda at Woodbury was yet another shopping spree at the Woodbury Common premium outlet. I love their range of brands here, but shopping could have been better during summer. It was -4 deg and we had to constantly get into shops to recharge our warmth. It's usually easier to park the kids in the bulky stroller with the man outside the shops, while I do a quick browse, but the cold winds was biting into our faces, everyone needs a hideout. I can't shop 'abandoning' them in the cold and I can't abandon shopping too. How conflicting! 31 Dec: Drove an hour from Woodbury to New York City. We visited the Central park Zoo, it was Madagascar without the Lion, Giraffe and Hippo. A very small place, which you'll be done within 2 hours. After which, we checked into our hotel and hurriedly return our car. It was New year's eve, the world famous ball drop countdown was at Times square. Our hotel were minutes away and most roads were closed. We needed to return our car soon. Parking fees is robbery in NYC. While at central park zoo, we clocked USD63 for just 3 hours of parking! Metro stations were convenient to bring us around the next few days. 01 Dec: We visited the American Museum of Natural History, entrance fee is required. It's pretty much similar to that we visited in Washington DC. Hence, I don't find it as interesting anymore. We then visited Top of the rock, which gave the finest unobstructed view of NYC. Simply beautiful. We had dinner at Sapporo, which was good. We ordered hot soupy ramen and Japanese beer. After dinner was chocolates at m and m's World. Love the colourful m and m, they have, colours beyond what we can buy in the supermarkets. 02 Jan: We took a boat ride for a close view of the Statue of Liberty. A pity that construction works were in progress due to hurricane Sandy, we couldn't get off the boat to visit the statue. We walked down wall street and there, we found the bull! Queued 20 mins to picture with it. Hope we have a bullish year ahead. Then we walked on to the World Trade Tower site, which is being re-constructed with skyscrapers around it. We had dinner at Grand Central Terminal. There were shops, restaurants and a market within. A very nice and grand looking historic place. NYC is much about sightseeing and crowd. It's tedious to find elevators for our stroller when taking metro. We had to carry it up and down stairs several times. 03 Jan: Took a 5 hours flight to San Fransisco and home sweet home. Upon collecting our car from the hotel, the engine could not start! Battery needs a jump start and we called in the mechanic. While waiting, we had dinner at Maxs, which was great. Love their Lemon honey chicken. And we thought, it was gonna be some big money spent on getting our car started, but the mechanic told us it was covered under our car insurance. Phew! Awesome to be home safe and sound. Holiday mood gets so drained when it's too long. I actually missed my routines and now I'm excited to get back to 'work'. 20 Dec - Arrived at Washington National airport and took a cab to our hotel in downtown. Very convenient location as we walked to most attractions. We checked in and walked out for dinner at Thai Tanic restaurant. Good and authentic Thai food they serve. Love their pad thai and tom yum soup. Only bad was, gratuity was unknowingly included in our total bill, which I thought was absurd. We wouldn't give that much of % for unimpressive service. 21 Dec - We had breakfast at Pret A Manger. I love their sandwiches and chicken noodle soup. Was simply good and extremely fresh! After which, we walked to the National Museum of Natural History for a day of knowledge. Museum isn't as boring as it sounded. The kids enjoyed and were amused by the exhibits. There were exhibits of Ancient Egypt, Evolving Universe and human origin, if you believe in evolution. They displayed a real mummy which was an eye opener to me. For some moments, the kids got confused between Mummy and their Mummy. Why the same term! There were also collection of fossils, artefacts and other animals. It was a good day of fun. Pret A Manger - They claim, "made today, gone today." 22 Dec - Also within walking distance from our hotel, we visited the National Air and Space museum. A place where you can view collections of historic air and spacecraft. They displayed real historic planes in there and those got the little ones excited. Some timings of the day, there was also storytelling session for kids. Did I mention? Entrances to the both museums are Free. We collected our rented car from Union Square and drove 2 hours to Philadelphia. We missed our collection time and was saved by a few minutes, arriving before they closed. We were rejected but my man 'pleaded' for help. And Thank God we got our car. If we've had more time, we would walk around Union Square. 23 Dec - Had breakfast at Dennys, which I was impressed with their breakfast menu. Was a good tasty breakfast we had. We then set off to Sesame Place for some theme park fun. It was freezing cold and challenging to stay outdoor for long. Spending minutes or more in lines got us very unbearable. We watched some musicals and took rides with little queues. After dinner, when the crowd subsided, we went on the rides till it was time for Elmo and friends to sleep. Swift and fast with no queues. It's different expectations. I thought the Sesame place would be really impressive, but it looks and feels kind of cheesy to me. Well, it made the kids happy but some rides are just not meant to handle crowds. Staying in line that moved inches frustrated us. The parade was crappy and extremely short. It paused frequently and long to dance and entertain, which wasn't good for audiences with obstructed view. Disney wins hands down. Or perhaps, it might be better to visit during summer when weather permits better play and with the wet fun attractions open. 24 Dec - We visited the Please Touch Museum which I was glad we did. The man was near to omitting this venue from our itinerary, but I spoke for the kids. It was awesome kids fun for the little ones. They loved it, so did I. Visit only if you have kids, it will be boring for the grown ups. It's an impressive place and as the name suggests, everything is touchable! If not, they'll just case it up. It's like an indoor playground for kids. There's also a carousel with very beautiful hand carved wooden animals that kids can choose one to ride on. You'll need to pay additional for the ride. The theater storytelling show was good. Both kids gave good attention to it. Entrance is not free, it's USD16 per pax. Same price for adults and kids above one year old. Great fun, but at costly price. We didn't know that the museum will close at 3pm on Christmas Eve. We visited late and wished we had more time in there for the kids to enjoy, and of course to make our entrance fees more worth. After museum fun, we had dinner at Sang kee noodle house, where we had Peking duck and some great Chinese food. Somehow, I still think Asian food is more yummy with lots of variety. Great restaurant, albeit a little cramped and crowded. And on this Christmas Eve evening, it started to snow! We were exhilarated and this marked our first white Christmas together! 25 Dec - Two major holidays that most places are closed throughout US are Thanksgiving and Christmas. That left us with limited places to go, and so we ended up at the National Museum of American Jewish History. Most Jewish don't celebrate Christmas, and there was a kid's party in there. We popped in by chance and bought tickets for the little ones. They had some craft and baby disco fun. Unless you are interested in American Jewish history, it's not worth a visit. 26 Dec - We got onto a sightseeing bus and toured around the attractions. We stopped at the Reading Terminal Market for lunch. It was pretty crowded during lunch and getting seats was like SG's foodcourt style, without the tissue paper reservation. Food vendors were interesting, ranging from fresh produce to crafts. So why named as 'reading terminal?' Beats me. I thought it was all about books! Philedelphia is a very beautiful place with historic and Gothic buildings all around. Driving isn't necessary if staying in central area. Metro stations are accessible to most places and parking isn't cheap in most hotels. We had to keep our car in the hotel's garage and not use it till we leave for our next destination. The longer you park, the cheaper your hourly fees.